Why on Earth would you build a closed Android phone? 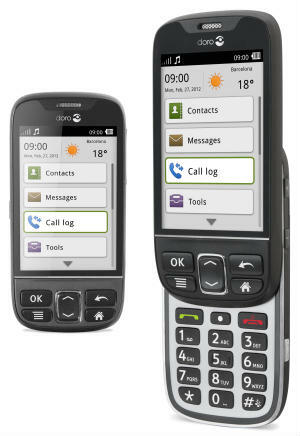 This is the Doro 740, announced at Mobile World Congress in Barcelona last week and expected to ship in the summer. While other Android phone manufacturers are struggling to differentiate their phones, this one has no problems: it’s aimed at older folk. The major players in the niche of "mobiles for seniors" have been debating the merits of touchscreens and smartphones. While these add flexibility there are some quite difficult cognitive issues to contend with. Some people's fingers do not have enough conductivity to drive a touchscreen, and actions like swiping and pinching can require a mechanical finesse that elderly punters no longer have. Other features, such as touching the thing you want the phone to do, make great sense. To cater for both camps, the 740 is a smartphone you can use without the touchscreen. The hard keys allow navigation and selection of any items in the menu and the sliding keypad makes dialling numbers easy. The keys are not only large, they are well-separated and ever-so-slightly concave to help locate less nimble fingers. Even the early prototypes feel mechanically good. The user interface is completely custom-made and doesn't look or feel like other Android devices on the market; the UI is the first fruit from Doro’s purchase of the French development house Prylos last summer. The design is centred around Doro's consumer base – you won't see the slick standard Android feel that could leave the target market feeling lost. Doro is keeping the user experience uniform and the design accessible by keeping the OS closed. There is scope for third parties to build accessibility applications but they will have to match the handset maker's look-and-feel, which it calls the “experience-based menu”. The fact that the mobile is built with a known software platform is ideal for mobile health where you might want to use Bluetooth to link to blood pressure monitors, scales or spirometers. There are several extremely useful features packed in: a 5MP camera that can be used as a magnifying glass and can freeze the image to make it easier to read; GPS; a motion sensor; and an emergency button on the back. There's also support for microphone and telecoil-type hearing aids. Doro also provides remote device management. While IT departments might be used to such things, this is aimed at people who want to look after their parents. Older child-sysadmins can update contacts in their parents' phonebooks, update wallpapers with photographs of grandchildren and wipe the phone if it gets lost. There will be developer support for these cloud services.